Who invented the Wedding Dress? - Who Invented? / LIFESTYLE / Who invented the Wedding Dress? Western Culture – Nobody invented the wedding dress – they have evolved over time. Originally in the middle ages and just after, weddings were unions for political reasons or strategic alliances between families and countries. The woman would wear fabrics and furs to reflect their families’ wealth, so silk and velvet would be featured. Poorer women would marry wearing their ‘Sunday Best’ – their smartest clothes they kept for attending church on Sundays. The first recorded bride wearing white wedding attire was Philippa of England in 1406 who wore a tunic with a cloak in white silk. The cloak was trimmed with squirrel and ermine fur. Until Victorian times wearing a white wedding gown was not a popular choice, with many brides just choosing their favourite colour. 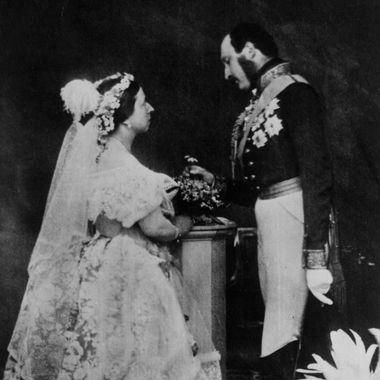 Queen Victoria married wearing an ivory silk gown in 1840 and from this point they started to become more fashionable. Though it should be noted that originally white was worn to indicate wealth and not the purity people believe today. This was because it was so hard to keep a white dress ‘white’, as there were no washing machines then and so a white dress was seen as a wear once special option. Now white dresses are the standard in Western culture and it is seen as being daring or unconventional to wear a dress which is not white, though in recent years this does appear to be becoming more of a trend.